As the name suggests, egg protein is the protein from eggs, namely the egg white (or albumen). Decades ago, before whey protein came into the scene, the preferred protein of choice for bodybuilding was egg protein. Indeed whey is a superb and convenient source of protein, but does that mean we should forget completely about the humble egg? I think not. Where Does Egg Protein Come From? Egg protein comes from...eggs (generally chicken eggs). The chicken egg industry is a huge enterprise producing eggs on a scale that is almost incomprehensible. Therefore there is never a shortage of high quality proteins coming from eggs. There are of course many types of chicken egg production systems. These include free range, barn raised, and cage raised hens. However, it has been shown that there is little difference in the protein content of eggs from different production systems (approximately 13% per egg) (Jones et al, 2010). Egg protein is a complete protein source, meaning it contains all the essential amino acids (and more) needed for life and muscle growth. Not only that but it also has a very high biological value and is the gold standard to which other proteins are compared. Also, unlike some types of whey proteins, egg protein is lactose free, and is therefore suitable for those who suffer from lactose intolerance. Protein is arguably one of the most vital nutrients one for muscle gain. Egg protein being of high quality is therefore a valuable protein for bodybuilding. One study showed that muscle protein synthesis increased with increasing intakes of egg protein up to 20 g, after which it plateaued (Moore et al, 2009). Furthermore, experts go on to say that eggs are a good source of leucine, which is one of the critical nutrients that are needed for muscle building and energy synthesis (Layman et al, 2009). Although egg proteins are very high quality, they are however, not as rapid absorbing as whey protein (Bilsborough & Mann, 2006). It is therefore in this writer's opinion that egg proteins are not a recommended source of protein immediately post workout. Instead, a high quality, rapidly absorbed protein such as whey should be used instead. Another concern is food allergy towards egg proteins. Egg allergies are the most common food allergy among infants. However, generally kids tend to grow out of this allergy within a few years (Soutter et al, 2002). Nevertheless, there are a small group of adults who suffer from egg allergy or intolerance. If so, it is recommended to avoid egg proteins and products that contain eggs. The recommended intake for egg protein is the same as for all other types of protein, which has been covered in detail in our "Recommended Protein Intake" article. Depending on your specific training regimen and goals, your requirements may be anywhere between 1.5 to 2 g/kg/day. Because egg protein is relatively slowly absorbed, it is recommended that it should be used throughout the day or before bed (similar to micellar casein), and not immediately post workout. A protein such as whey protein would be better utilised immediately after training. Egg protein can be found as a stand-alone egg protein powder. Alternatively it is actually a very common ingredient in weight gainers, blended proteins, meal replacements, bars, and more. Being a protein supplement, egg protein can be stacked with almost anything. 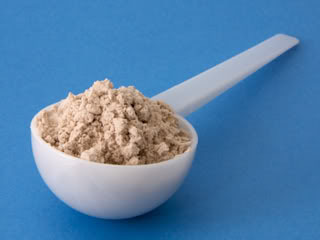 It is a good complement to other proteins such as whey, soy, and casein.